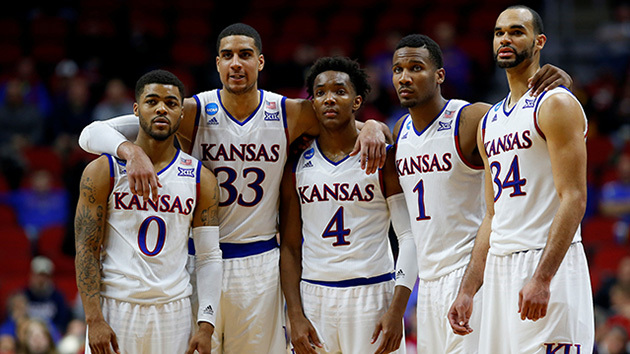 Everything you need to know about the Kansas Jayhawks as they head into the Sweet 16. The Case For: None of the No. 1 seeds looked better than Kansas did the first weekend. So there is no second-guessing the Jayhawks as the top overall seed in the NCAA tournament field, nor as one of the prohibitive favorites to win the title. While the game results against No. 16 seeds mean next to nothing, Kansas faced the best second-round foe according to kenpom.com’s metrics—Connecticut, which ranks 25th nationally in adjusted efficiency—and led that game by as many as 24 points in the first half. That’s a sign of a team completely locked in and unfazed by the first-weekend tournament exits of the past two seasons. Kansas’s interior defense and rebounding has become a notable strength with 6'10" junior Landen Lucas and 6'8" senior Jamari Traylor doing most of the work to hold down the paint. They have the best defensive ratings among rotation players (91.3 for Traylor and 91.5 for Lucas) and they powered the Jayhawks to a 44–24 advantage against Connecticut on the glass. If they don’t surrender easy buckets or offensive rebounds, they’re going to be near-impossible to beat, short of an epic shooting performance from long range. And even then, Kansas has Selden heating up: The junior had 14 points in 19 minutes against Austin Peay in the first round and then 22 points on 8-of-15 shooting against Connecticut. Of some concern, too, is Frank Mason’s shooting touch. In his last three games—the Big 12 tournament final and two NCAA tournament outings—the junior guard is just 5 of 23 from the floor combined. He has missed all seven of his three-point attempts in those two games as well. It’s not time to panic, especially if Selden and Ellis continue to score with high efficiency, but the Jayhawks would be less vulnerable if their leading scorer gets back on track. SI Prediction: Beat Maryland in the Sweet 16; beat Miami in the Elite Eight; beat Oklahoma in the national semifinal; lose to North Carolina in the national championship game.